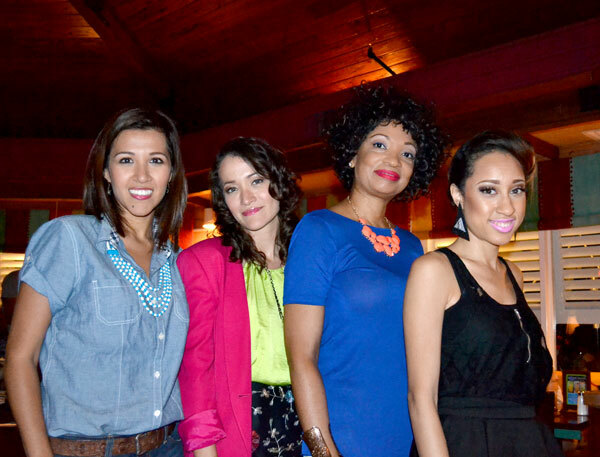 Hello, yesterday I attended a dinner with the Beauty Bloggers of Central Florida group from Facebook at Bahama Breeze. We had so much fun! It was around ten ladies, the majority being beauty bloggers, but they adopted me and my fashion blog in the group. We had dinner, margaritas and shared tons of blogging tips on our laptops. Everyone was super nice. In my last picture I am with my sister Cat from www.beautybycatblog.com, Pam from pamelascloset2 andToni from toniizbeauty. Check them out. I am wearing a vintage skirt, that I cut and hemmed to make it short, this blouse that I found yesterday at Ross and a fuchsia blazer that I got in the thrift store about a year ago. Hola, aqui están las fotos de ayer cuando fui a una cena con el grupo de facebook Beauty bloggers de Florida Central, fuimos el restaurante Bahamas Breeze. Estubo super divertido. Fueron como 10 muchachas todas son bloggeras de Belleza y a mi me adoptaron de moda. Comimos riquísimo, tomamos margaritas y todas trajimos muestra compu y compartimos un monton de trucos de bloggear. Todas son super chevere. En la ultima foto salgo con mi hermana Cat de www.beautybycatblog.com Pam de pamelascloset2 y Toni de toniizbeauty visiten sus blogs. Me puse esta falda que compre en una tienda de segunda y la corte para hacerla chiquita, la llevo con una blusa que compre en Ross ayer y un blazer que compre en tienda de segunda hace como un año. You look gorge! I wish I could've been there! I met your sister @ the last meet-up. I cover a hodgepodge of beauty & fashion on my blog. Love your style!